Everyone is complaining about sky high food prices. Why are they going nuts? The fault is mostly due to harsh weather conditions of drought, vicious storms, floods, soggy soil, hail, frost and ice, and ferocious winds. Escalating extremes have beaten fruits, vegetables and farm animals to death around the world and we’re paying for it – literally. In the last 3 years, America was slammed with 32 multi-billion dollar disasters that for the most part, hit during crop-growing seasons. The 2012 Drought / Heatwave alone took a $30 billion bite out of peoples’ pockets. For the past three years drought has decimated Texas cattle herds by over 2 million head. Now California’s cattle are getting smacked. This is small potatoes by comparison, but last year South Dakota lost 30,000 head – frozen in a single November blizzard. Our neighbor to the south, Mexico, lost 1.7 million head in 2011 due to drought. There are other cattle losses as well, but there’s not time to document them all. It used to be that cattle herds took about 3 years to replenish. Experts stated this week it could take the rest of this decade – 6 years – to rebuild America’s beef and dairy livestock. That’s double the norm. Meanwhile, food prices continue to ramp up. That’s ifno more catastrophes descend. How much do you want to bet on a lucky break? In the first 3 months of this year, 1/3 of the U.S. is in USDA-declared crop disaster areas. Gas prices are moving up again with Brent Crude kissing a $100/barrel yesterday. It costs more money to move produce, dairy and meat from farmer to fork. Also, more countries are eating better so farmers ship more food to other nations. This puts a squeeze on our supply. Then there’s the idiocy of bio-fuels, which takes another bite from food stocks. However, the most direct and dire cause of rising food prices is unquestionably weather disasters. You don’t need to have this much space dedicated to veggies. 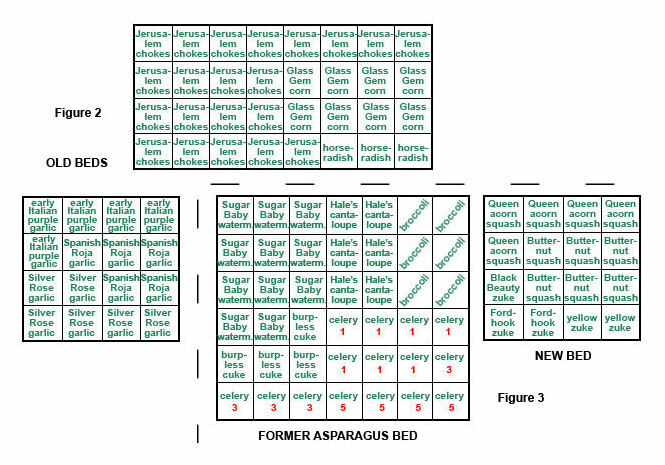 Generally speaking, all that is needed is one 4×4 bed for salad greens and one 4×4 bed for vegetables for each adult. See? It requires little space for the basics. However, in light of ever-darkening current events, worsening weather and escalating grocery prices, we’re taking out our own food insurance for pennies on the dollar. Since the world is now a global food store, everyone’s pain is our pain and we all feel it at the grocery store. If you’re a newbie gardener or are bleary-eyed from reading news, here’s a look at our layout for this year’s crops. Stan and I practice what we preach and have greatly expanded our veggie gardens this year. In fact, from 8 years ago, they’ve doubled in size. Some of the harvest will be canned, some frozen, some eaten fresh, some given to friends and some taken to the homeless shelter. Nothing will go to waste. We see hard times coming this year and having an ample garden is one way to fight back. Image: This year we really concentrated on what we like to eat and grow just that. Figures 1, 2 and 3 show the layout of this year’s gardens. We’ve expanded them considerably in light of much higher food prices. It will save money in the long run. See the first article in this series, How to Beat Coming Killer Food Shortages. Since we grow organically, we won’t fall victim to repeated fruit and veggie recalls due to E. Coli, listeria and salmonella contamination. Numbers in red are the weeks that successive crops will be planted. For example, the first lettuce, carrot, radish and spinach seeds were sown on March 29. Second crop will be planted April 12 and the 3rd crop on April 26. For radishes, since they only take about a month to harvest, the 4th planting on May 10 will go where the March 29 seeds were and so on. For peas and other lettuces, we’ll plant for Fall crops. Last year, we had tons too many tomatoes, summer squash and zucchini and ended up giving away more than half of everything. Neighbors were happy to help us with this! We still have plenty of Jalapeños, Serranos and Big Jim/Nu Mex in the freezer from 2013, so this year, the garden will just grow Santa Fe chilies. Bell Peppers have a ton of uses whether they’re eaten fresh or grilled or included in salads, omelettes and kabobs. Extras at the end of season can be Ziplocked and frozen to make colorful tasty additions to soups and stews. Zucchinis over-produce for our use, so there will be just a couple of seedlings planted. Since we adore baked Acorn and Butternut squash we’ve allowed for plenty. They store for months and are super versatile. Combine the ingredients in a small bowl and stir well. Store in a covered container. Makes 1/3 cup. Stan is a major fan of small watermelons, so we’re planting a bunch of Sugar Babies. Ditto for Holly on cantaloupe. The best ever is grown just a few miles away – Rocky Ford. Yes, this is the same ‘loupe involved in the 2011 listeria outbreak. Regardless, they are the sweetest cantaloupes on the planet. To be clear, Jensen Farms in Holly, Colorado that was responsible for the listeria drama is not the same as Rocky Ford Grower’s Assn. They are 100 miles apart. To further confuse things, Rocky Ford is both a place and the name of these luscious ‘loupes. Image: The dotted line represents two different growing areas. The two ‘old beds’ on the left are out by the orchard and the two ‘new beds’ are about 50 feet off the back deck. We love Snap and Snow Peas and Green Beans and have been known to munch them straight off the vine. 🙂 Plus, they freeze well. Since beans and peas are something we consume regularly, we’re planting a bunch. And then there’s Pinto Beans. Stan and I must have Hispanic roots somewhere “in another life” because Tex-Mex is our favorite food bar none. Nothing beats a hair-raising, nosebleed-bitingly flavorful bit of really southern tucker. This brings us to that weird patch of cilantro in Figure 1. It is integral to many Tex-Mex meals. This stuff simply won’t die out. It grew throughout winter with no water in sub-freezing temps. So for its faithfulness, we let it live, otherwise I’d dig up this herb and replace it with a veggie. TIP: Spices can take up as much room as veggies. Economically speaking, it’s more cost-effective to buy them in bulk from Tone’s and save your space for fruits and vegetables. Besides Tone’s for dried bulk buys, check McCormick, Frontier Natural Products Co-op, Monterey Bay Spice Company and My Spice Sage. We’ve purchased most of ours from the first three, not the last two. However, nothing beats the fragrance and flavor of fresh herbs and spices. Four years ago, we put in an asparagus bed with 47 crowns. You’d think that’d be plenty and then some. Mistakenly we thought multiple varieties would be clever. Not so. The Martha Washington, Jersey Giant and Jersey Knights were ready at different times. Some were thicker and some thinner, which meant they steamed at different times. There wasn’t a single instance when more than 4 or 5 stalks were ready to harvest simultaneously. Not exactly a side dish for 2. It was a nice stalk here, 2 more there. Since we live in the high desert, it was a perpetual uphill fight to get them going productively, like pushing a boulder along with a toothpick. Plus, you’re not supposed to harvest the first year’s crop. More waiting. Florence, a town just 30 minutes west of us, has them growing wild by the Arkansas River. When our neighbor lived there his mom sent Jerry nightly to pick all they needed – for free. Lucky dog! If in having a practical, usable garden, some things are just too difficult and expensive to cultivate, yell calf rope! Enough already! This year, the asparagus patch now holds melons, cucumbers, broccoli and celery. Don’t be surprised if, over the years, your garden beds morph. This is what we started with in 2007: 6 – 4×4-foot beds. The strawberry bed is history. They didn’t produce enough at the same time (like the asparagus) to warrant the space. Unless you have time every week to cut off runners, the bed soon becomes an overgrown, tangled mess. For fruit, these plants were replaced by raspberry, blueberry, grape and elderberry bushes on a berm not pictured. Also in the fruit department are 15 trees consisting of varieties of apple, peach, plum, pear and cherry. Photo: In eight years our gardens have changed considerably and doubled in size. The cedar beds (pictured above) didn’t weather well in Colorado’s high altitude and strong UV. Gone are the chicken wire walls and cages. Where the 4 – 4×4 beds were on the left are now 2 – 4×4’s and 1 – 4×8. The two decorative brick beds on the right have morphed into two more 4×8’s. Our total bed space is this: 4 – 4×4’s, 4 – 4×8’s and one goofy-sized 6×7. We use recycled plastic and natural fiber board raised beds from Frame-It-All with nifty animal barriers. They also sell very cool attachable greenhouse tops and trellises. The image below of a Frame-It-All 4×8 bed is their older model for the animal barrier. Now where “A” is, it has a cap like on “B”. This allows for multiple 2-foot additions of animal barriers – in case you have tall invaders! Numerous other companies manufacture similar raised bed kits. We just happened to land on Frame It All and stuck with them for continuity. You can also build your own as detailed in Garden Gold. All of our beds are 12″ deep, which makes rotating crops no problem. If you use only a 4″ or 6″ high board, which holds just 3-5 inches of Super Soil, it makes growing potatoes, carrots and some other root veggies nearly impossible, so it greatly cuts down on the ability to rotate crops. With extra depth, there is always flexibility. It’s vital that crops are rotated yearly to naturally prevent bug infestations. Not every bug likes the same veggie so if they’ve visited cauliflower one year, next year’s crop of cauliflower needs to go in a different area. This is one of the main natural preventative techniques used by organic farmers. SIDEBAR TIP: Also changed is the 500 gallon propane tank pictured above. No, it’s not gone. When natural gas was made available to our area, we chose to go with it. However, we’ve kept the propane tank – always filled – for back-up fuel. In the event of a prolonged power outage – as in months – gas appliances can be switched back to propane. You can’t believe how much less expensive it is to refill your BBQ canisters from this big tank. It’s always available so if you’re cooking and the 20-gallon BBQ tank is unexpectedly empty, it’s easy-peasy-cheapy to fill up. Areas around the beds are now grassed in. That, combined with the Chinese bio-intensive growing method of planting everything close together keeps weeds at bay as there’s no place for them to take root. In case you’ve read our accounts and saw this video of massive tumbleweed issues in southern Colorado, it’s best not to give their seeds a place to land. It’s also easier on the feet and knees than surrounding beds with sharp, decorative rock. All it takes is a quick go with the Weedeater to keep grass in line. Holly Drennan Deyo is the author of three books: bestseller Dare To Prepare (4th ed. ), Prudent Places USA (3rd ed.) and Garden Gold (2nd ed.) Please visit her and her husband’s website: standeyo.com and their FREE Preparedness site: DareToPrepare.com.